Remember that cloth napkin project I've had going on all summer? Well, it's finally done, dammit. I mean, dangit. Done. O-V-E-R. 40 napkins complete and folded and stacked neatly in a basket in our kitchen awaiting dirty faces and greasy hands. Bu-bye paper napkins. Fare thee well. Also, I was thinking, I am going to do my very best to put up several tutorials between now and the holidays--to do what I can to support all of you in making and giving your own handmade gifts. Handmade is important. It means more--but I don't need to tell you that, do I ? My dear clever readers know exactly where I am coming from--I'm sure of it. 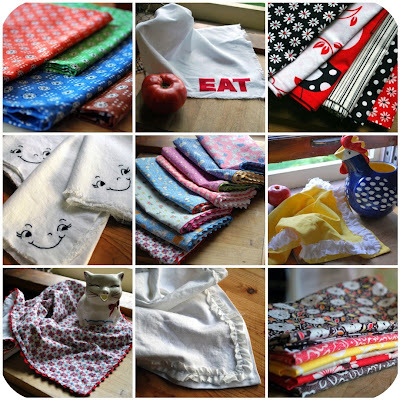 Anyway, so the napkin tutorial is the first in several more to come over the impending weeks as the holidays bear down upon us all--because someone on your holiday gift giving list just may be in need of some cloth napkins--whether they know it or not. 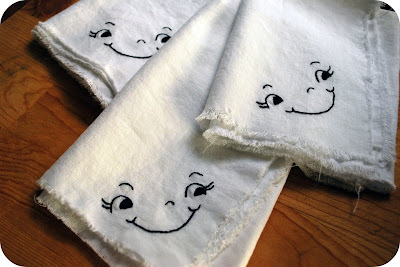 And a couple more things I want to point out--like the final two napkin varieties I made to finish up my crazed napkin project...yes, these vintage-inspired happy faces that I embroidered onto the corner of some linen napkins. Sweet, non? And also, easy-peasy because I did not finish the edges so all I had to do was sit on my arse with embroidery hoop, needle and napkin and embroider away while the autumn wind rampaged outdoors. And yes, the embroidery pattern for these is in the tutorial, if you care. (and I think these may be my favorites of all the varieties made--these and the "EAT" ones) And finally, remember those yellow ruffled napkins I made earlier? The 70's tux looking ones? Well, here they are revisited with a more sedate and modest ruffle in white on white. And this was EXACTLY what I was aiming for when I decided to do something with a ruffle. Much more demure and lovely, much less like a 1970's prom tux and polyester prom dress cast aside in a pile on the floor of a cheap motel. But hey, if you like that sort of thing--by all means, make those ruffles bigger because I included the ruffle measurements for both of the napkins in the tutorial. Oh, and if you want to see more photos of the napkins for reference--find them all here. Love! I only wish I was as industrious as you...But I love each and every variety. Thanks for being your super-generous, always-awesome self! You are awesome. I love, love, love cloth napkins. I wonder if I made a huge stack of awesome ones like you did I could convert my husband away from paper? Stitchminx--I am SO like that. I see something someone made--then I suddenly have about 12 ideas of how it could be different or reimagined or become something entirely different than what it really is that you are looking at...I hope those quilts and blankets come to fruition for you--and share the results if you make something. I would love to see it. I love your napkins! I recently bought at a yard sale 2 sets of gingham sheets. One was pink check and the other was blue check, guess what they are going to be? Yep, you guessed right, napkins. It is just my husband and I but we still get messy 8>) Thanks for the great ideas. Love your blog. Awesome!!! Thanks for the tutorial! I'm now a follower of your blog so that I don't miss a thing! Wow, it´s the first time I have come to your blog and love love love the stitched faces. 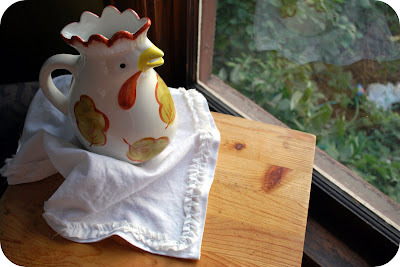 Just found your blog via One Pretty Thing...great post about the cloth napkins! I just finished making a set myself, and thought I was done until I saw the white ruffly ones you made...Now I have one more project on my to do list! I have to admit, I had no idea cloth napkins could generate this much enthusiasm or interest. Wow. But thanks to everyone who has been leaving a comment--so good to hear from different people visiting right now. Awesome tutorial! I love all the different finishes for the cloth napkins! Love these! I got out my sewing machine and am now napkin obsessed! My kids take them in their lunch - white ones I bought. Now I will be able to send them off to school with a homemade lunch AND napkin. Thanks for the idea! Thanks for the photos and the tutorials. You've inspired me to get busy and get the paper out of my kitchen! I'll be back to visit soon. People--your comments are just blowing me away. I am so happy to know you are using it, enjoying it, and even feeling inspired to get rid of the paper in your own kitchen. And also, thanks for taking the time to leave a comment--I really appreciate your words, observations, sharing your experiences. This is brilliant. i have been ...er, meaning to... make cloth napkins for about a year, ever since i quit buying the paper ones and we've had to resort to licking our fingers. your ideas are just what i needed to get a jumpstart. it's a cloth napkin revolution around here. many people i know will be getting them for christmas. Found it interesting that we were thinking napkins at about the same time! I am just making mine through the year though, using up extra fabtic from projects. I have been binding them like a quilt with all that left-over quilt binding. Love your Aunt Grace with the ric-rac. May have to copy you on that! I put links to my blog posts on napkins. Melanie--I love that you bought skirts to make napkins from--going even greener in your pursuit of being green. You can find a lot of great fabrics from skirts though--I have this zebra print corduroy skirt I thrifted some time ago that I am still trying to figure out what to make from it--a plushie of some sort... Also, the drawstring gifts bags as packaging for the napkins is brilliant. What I love about the drawstring bags is that they can be re-used--I made drawstring bags for my son's birthday party favors he gave out, and the kids are finding all sorts of uses for them. My son uses his to stuff 5 or 6 super hero action figures into when we are going out to eat--because apparently our company is not fun enough for him. Totally inspiring! Thank you for posting this! I'm blogging a list of things I hope to make for Christmas, including this. Is it okay that I put a link to this tutorial? And a pic of your completed ones? Please--feel free to link to my tutorials on my blog. The one thing I always ask is that people driect link to the entry on my blog and do not direct link to the pdf document itself. Thanks for linking--makes me smile! May I feature this tutorial on SewCanShe.com? Please drop me a line at caroline@sewcanshe.com if that's okay. Thanks! Nice tutorial,thanks for sharing this. Choose a stamp with a simple design. Small details and fine lines won’t print well. You can also carve your own stamp using a block of rubber and a carving tool, available at craft stores.